Bubby and Bean ::: Living Creatively: GIVEAWAY // Share Your Plant Personality + Win a Custom Tea Set! 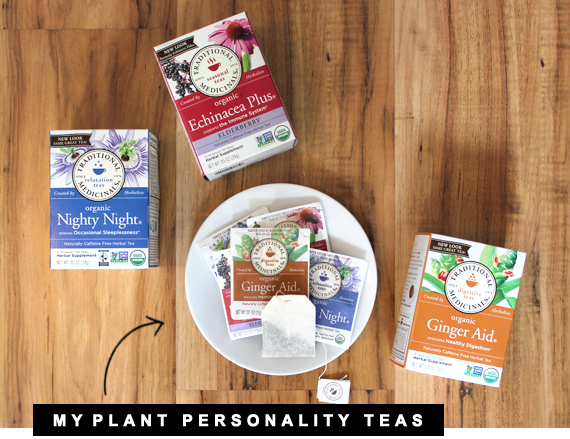 GIVEAWAY // Share Your Plant Personality + Win a Custom Tea Set! Ever since I was a little girl, I've been interested in plants and herbs and their relation to wellness (thanks to my mom, who grew herb gardens since before I was born). 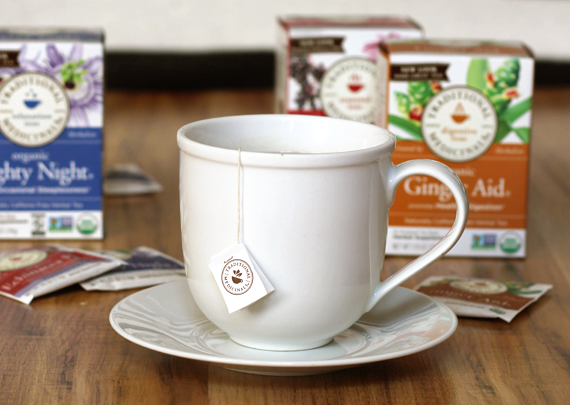 And equally as long, I've been a huge fan of Traditional Medicinals teas. Sleepy Time has been my go-to comfort tea at night for more years than I can remember, and their organic Peppermint tea helped with the queasiness I experienced during my pregnancy. They're also the kind of company I like to support. For over 40 years (!) they've been focused on harnessing the power of plants, with a commitment to using high quality herbs and embracing ingredient purity, sustainability, and social and environmental activism. 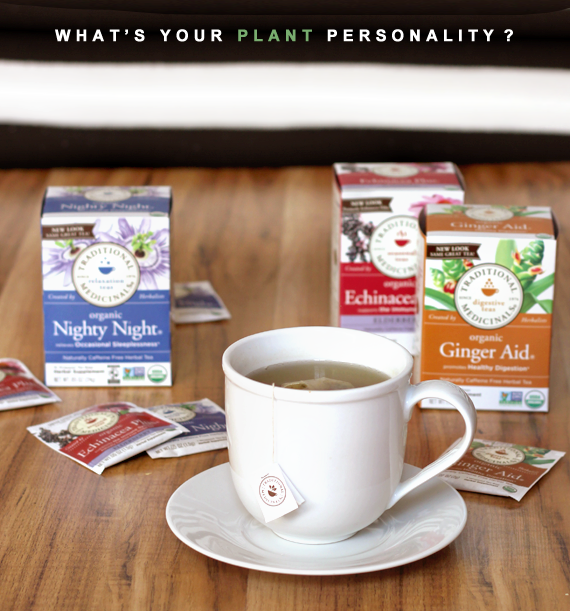 Recently Traditional Medicinals released the coolest little project called the Plant Personality Quiz, where you can answer a few questions and your unique 'plant personality' will be revealed. In less than two minutes, you find out a the exact combination of plants that reflect your nature, provide insight into your personality, and highlight your 'plant allies' that may harmonize, balance, and complement or support your overall wellness. Pretty cool, right? 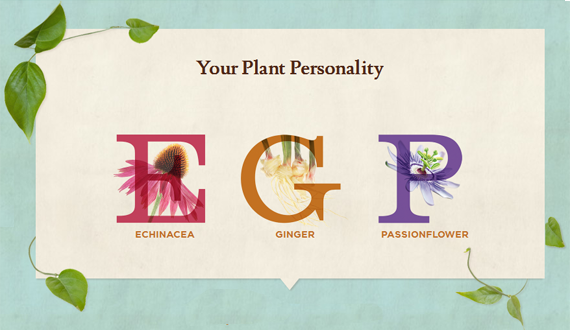 My Plant Personality is Echinacea Ginger Passionflower (you can see my specific results and the meaning behind them right here). My custom corresponding teas - all of which are certified organic and non-GMO verified - are Echinacea Plus (supports the immune system), Ginger Aid (promotes healthy digestion), and Nighty Night (relieves occasional sleeplessness). I've been especially enjoying the Ginger Aid - it's deliciously spicy and sweet, and soothing on my tummy after mealtime. It was so much fun to take the quick quiz (which is also aesthetically quite lovely), learn my results, and then receive a custom package that included the teas that coincide with my quiz results. And now 3 of you are going to get to do the same - because Traditional Medicinals is giving 3 Bubby and Bean readers each a personalized selection of teas that match your unique Plant Personality! To enter, just take the Plant Personality Quiz, then leave a comment below telling me your plant personality! This giveaway will run through April 24th and is open to all Bubby and Bean readers. The winner will be randomly chosen and announced shortly after. (Important: Please make sure to check back and/or leave a way to contact you in your initial entry.) Good luck! Thank you to Traditional Medicinals for providing the prizes for this sponsored giveaway. I got DNP! Dandelion, Nettle, and Passionflower :-) This was a fun quiz, by the way. Very creative! I liked Tradicional medicinals on Facebook. I followed Traditional Medicinals on Twitter. I followed Traditional Medicinals on Pinterest. I pinned the top picture to Pinterest. I am chamomile, nettle, Slippery Elm. EFN- Echinacea, Fennel, Nettle- which is surprisingly spot on! Liked Traditional Medicinals on FB. CDS- chamomile, dandelion, slippery elm. Like Traditional Medicine on FB! I follow Traditional Medicine on twitter. I follow Traditional Medicinals on pinterest. My plant personality is Dandelion, Echinacea and Fennel. I am chamomile, nettle and passionflower. I clicked fb like button. I Like Traditional Medicinals on Facebook. I liked traditional medicinals on fb. i follow you on instagram. thanks! This was SO fun, I love tea! I got Echinacea Ginger Peppermint. I have a Dandelion, Nettle, and Passionflower Plant Personality! Perfect spring quiz! I liked Traditional Medicinals on facebook. I got dandelion, fennel, passionflower! I love tea and would love to explore more! aw fun quiz! i'm FNP - fennel nettle peppermint! My plant personality is Echinacea, Fennel, and Slippery Elm! My plant personality is Fennel, Passionflower and Peppermint (quiet, kind, poised) which describes me exactly! My plant personality is dandelion, nettle, and passionflower! I'm apparently Fennel, Nettle, Passionflower.